We live with two cats, Thisby and Renfield. Thisby we retrieved from a cat-lady out near Coney Island. She (the cat) tends to be heavy, and occasionally resembles a wedge when she sits in the kitchen staring at us with that look of disdain. Or is it reproach? Renfield was found one Halloween night several years ago. Renfield is a cat completely at home with himself in the belief that he is the king of all things. He is also the creature who has incurred a couple of medical bills that caused a certain vet to rub his hands gleefully together whenever he saw us come in the door. 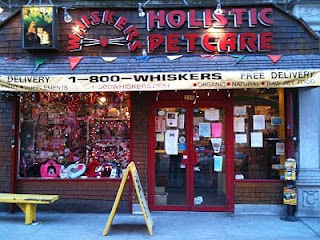 This is how and why we discovered Whiskers Holistic Pet Care. The vet, in his great wisdom, had prescribed a particular dry cat food (Hill's Prescription Diet® k/d® Feline) that could only be purchased from him, or as I discovered after paying that exorbitant price a couple of times, through an online source that nevertheless insisted on seeing that damned prescription (clearly someone was afraid that I might eat that very special food for the high!). So Georgina and I asked a woman at Whiskers what could be done. The first thing she said was "don't feed your cats dry food." What do you know? It turns out the cats have been correct in their assertion that they are just smaller versions of their ferocious-snarling-beasts-of-the-jungle cousins. They need meat. They are thriving. We don't need prescription cat food. Whiskers gave us straight from the hip knowledgeable information. The cats are happy. We are happy. The vet? His Mercedes payments are late.